Picture this: Diana Wisen crawling into the recycling bin and over the recyclables, hauling out bags of food-related garbage (you know who you are and where you should have put it), Styrofoam, 2x4s, and other items inappropriate for the recycling bin. Or Sharon Wootton reaching in and pulling out uncrushed boxes (some with you names on them) and doing the Two-Step Mash before inserting them back into the bin and saving space. This is not a good thing. The right thing is to follow the guidelines, save bin space and the community’s money, keep the recycling folks happy and Diana out of the bin. Thanks to everyone who follows the guidelines. We will post them on our electronic kiosk. As to Styrofoam, it can be recycled in Anacortes at 2201 37th St., by the bus barn. 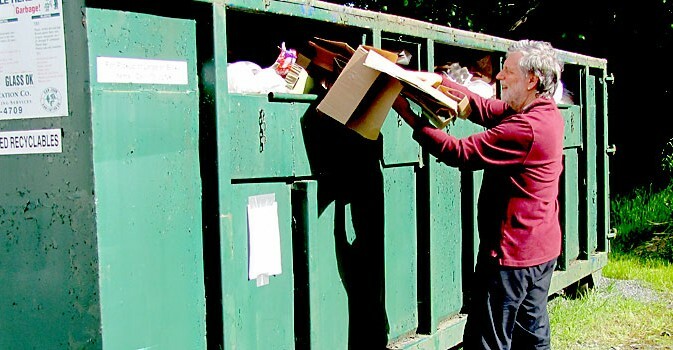 There is a dumpster where it can be deposited during the city’s open hours, 8 a.m.-5 p.m. Monday through Friday. For information, call 360-293-1921.